Prince Harry made an emotional speech at the opening ceremony of the 2017 Invictus Games in Toronto, Canada, on Saturday, September 23, speaking out about what the competition means to not only him, but the competitors. 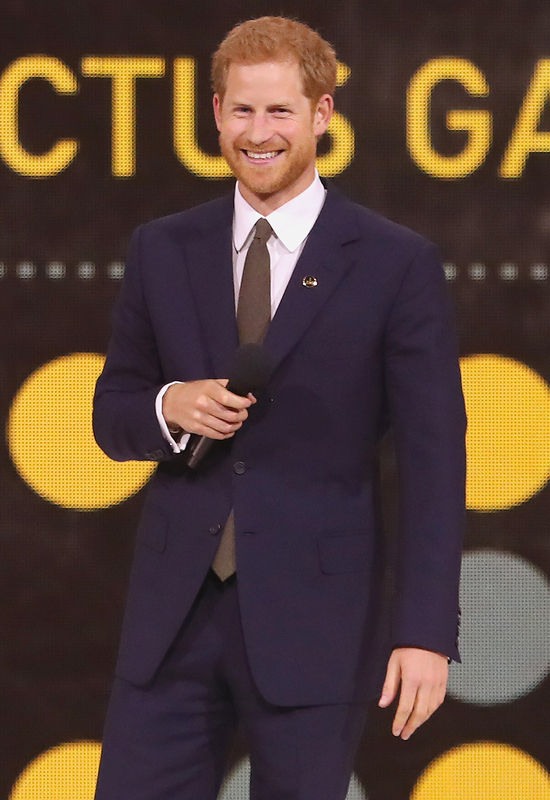 His heartfelt speech was greeted with applause from those in attendance, including Harry’s girlfriend, Suits star Meghan Markle. The actress, 36, looked trendy while sitting with a friend and wearing a purple leather jacket slung over her shoulders. The Invictus Games marks the first time the couple, who met in May 2016 but didn’t make their relationship official until October 2016, attended a public event together. This is not the first time the lovebirds have been together in the Canadian city where Markle films her hit USA Network series. As Us Weekly exclusively reported, Prince Harry made a top-secret visit to her home in November 2016. During the opening ceremony, Prince Harry sat alongside First Lady Melania Trump, who he met with earlier in the day. Markle was seated a few rows away. The games began Saturday night, kicking off eight days full of sporting events that include 12 adaptive sports that will feature 550 competitors from 17 nations. They will end on Saturday, September 30, with a concert featuring performances by Bruce Springsteen, Kelly Clarkson and Bryan Adams.